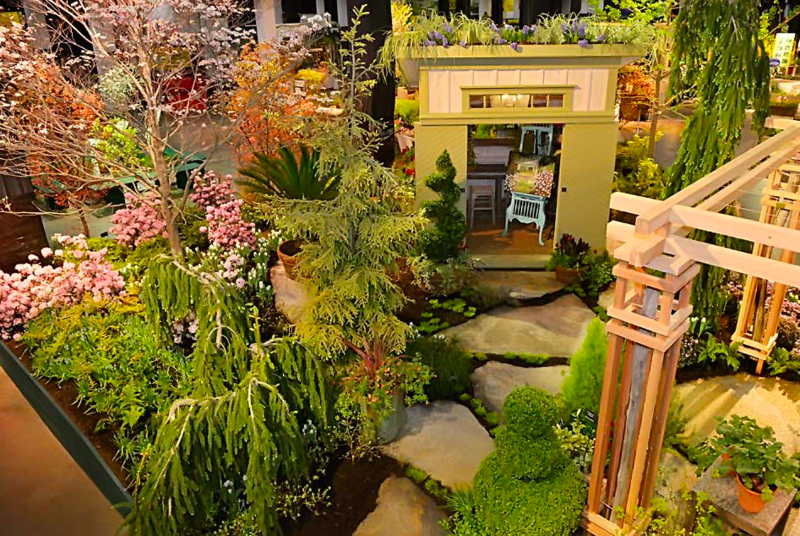 Miskovsky Landscaping and Haskell Nursery present a garden display at the 2019 Boston Flower and Garden Show. From March 13 to 17, visitors from Boston and beyond swarmed into the Seaport World Trade Center for this year’s Boston Flower and Garden Show. Themed “The Beauty of Balance,” the event boasted an array of live landscape and floral displays, contests, exhibits, contests, and shops. Immediately beyond the abundant, multi-colored floral arrangements guarding the venue’s entrance, an entire path of award-winning landscape gardens greeted attendees. Designers used miniature trees, flowing streams, stone pathways, tea tables, and oak gazebos to put together life-sized displays. In response to this year’s theme of “The Beauty of Balance,” landscape design company Samantha’s Gardens created a display complete with a candle-adorned meditation hunt. “We attempt to capture the calm, soothing tranquility of a natural forest scene with a meditative state that draws individuals to immerse themselves in the beauty of nature in hopes of bringing balance back into their lives,” the company wrote in the landscape’s description. Samantha Mannarino, owner of Samantha’s Gardens and fifth-year participant of the Boston Flower and Garden Show, said she was especially fond of this year’s theme. Mannarino and her partner, Vlasta Benedict, started working on their exhibit over six months prior to the show. “Vlasta and I knew what we wanted to do last year. We really kind of get down and dirty in between fall and Christmas and then it all takes off from there,” Mannarino said. Small boutiques, food vendors, and galleries flanked either side of the trail of live displays. Some of these booths offered historical information: Plymouth 400’s “‘Our’ Story: 400 Years of Wampanoag History,” for example, chronicled the capture and enslavement of 27 Wampanoag men near modern-day Plymouth and Cape Cod. “This tragic and compelling backstory to the colonization of Plymouth has been long overlooked and comes to life in the exhibit’s dramatic images and video impact statements,” the exhibit’s panel read. Other exhibits included an art gallery from the New England Society of Botanical Artists, a shop selling Handmade Garden Mushrooms, a table of carnivorous plants, and an Ask the Experts Pavilion. Each day of the event also offered an assortment of different workshops, lectures, and demonstrations. With over sixty time slots across all five days, professors and other gardening experts shared their advice on everything from “Hip, Hip Hydrangea – Complete Primer for Identifying, Planting, Pruning and Maintenance” during the week to “Growing Cannabis Made Easy: A Quick Guide to a Legal, Personal, Cannabis Home Garden in MA” on the weekends. During the show’s peak hours, the lecture hall was at full capacity. Attendees Maureen and Rachel McNeil attribute the Boston Flower and Garden Show’s popularity to people’s anticipation for spring. “You go through a winter where you’re inside most of the time, and when you finally feel like spring is coming, you just want to get out and start getting ideas for your own landscape,” Maureen McNeil said. Mary and Allan Pfeiffer, a couple from Melrose, Mass., have been coming to the show annually for over 35 years as a “tradition to welcome the spring.” Over the years, Mary Pfeiffer says believes the show has become more commercialized. “There were more live displays and less shopping areas,” she said.